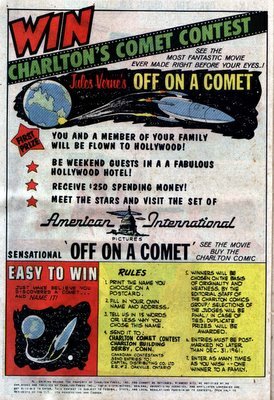 Now here's something interesting: an advertisement from an old Charlton comic, REPTISAURUS #3, published in January 1962. (The first two issues of REPTISAURUS were called REPTILICUS and "Based on the American International Pictures Film," but I'm guessing all that changed when the folks at Charlton saw a preview of the film and decided it might be wise to withdraw from that affiliation. In the first REPTISAURUS issue, the creature is unmistakably still Reptilicus and hurriedly recolored red, but the creature's look changed completely for its next comic book appearance.) But do you know what's so interesting about this ad? It promotes a movie that was never produced. As someone who was a kid in those days, I can remember that Jules Verne was pretty hot stuff. It had all started (or re-started) with Disney's 20,000 LEAGUES UNDER THE SEA (1954), which was somewhat before my time, but Verne Fever was still in progress in the early years of my time, even the early years of my time as a moviegoer. AROUND THE WORLD IN 80 DAYS (1956), FROM THE EARTH TO THE MOON (1958), JOURNEY TO THE CENTER OF THE EARTH (1959), MYSTERIOUS ISLAND (1961), FIVE WEEKS IN A BALLOON (1962)... and let us not forget Karel Zeman's wonderful live action/animation combo Vynález zkázy (1958), which turned up here in America in 1961 as THE FABULOUS WORLD OF JULES VERNE. In May of 1961, AIP had hopped aboard this public domain money wagon with MASTER OF THE WORLD, starring Vincent Price. It had done well for them, and they were deternined to maintain a foothold in the Jules Verne saddle. 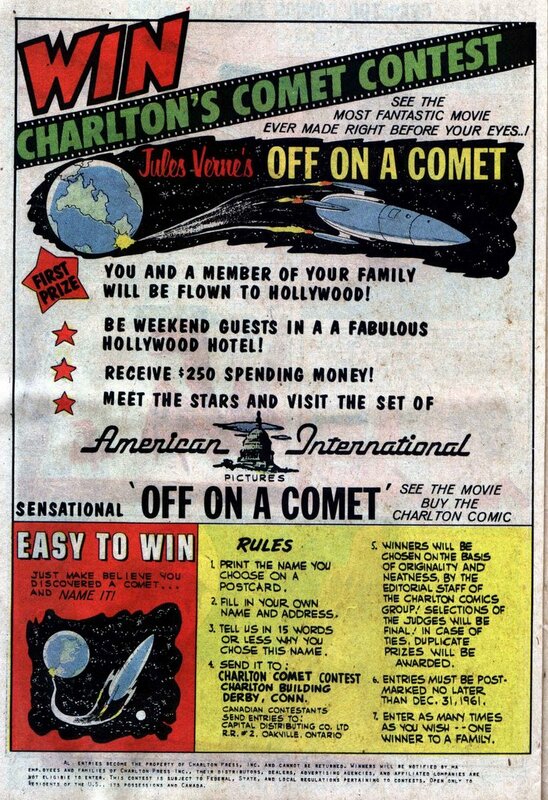 Evidently after taking out this ad, it was brought to the attention of the folks at AIP and Charlton that Jules Verne's OFF ON A COMET had already been made -- as the recently released VALLEY OF THE DRAGONS (1961), distributed by Columbia. Suddenly, there were no more Jules Verne titles forthcoming from AIP. 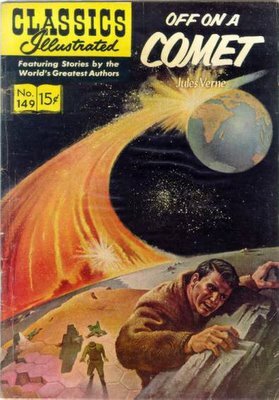 Consequently, the Charlton Comic of OFF ON A COMET promised in the ad also never happened, but some of us kids had this nifty Classics Illustrated adaptation. PS: It seems that Blogger has been suffering from some kind of network problem the last couple of days... maybe it was only one day, but it felt like a couple. Anyway, I couldn't access my blog and couldn't post anything new during that period. Most of you couldn't either, because yesterday we had the lowest attendance since we started -- less than half our daily average. I discovered that the system was on the blink after trying to post a blog I'd spent two hours writing; it vaporized in the process. Losing that much work isn't exactly gladdening, even if it usually is improved by its reconstruction from memory. So, from now on, I'll be writing/saving this blog in Word before I post it here. Never fear about the lost article; I patiently reconstructed it in Word. This allowed me to see a manuscript page count and I realized that the blog I was writing was too long, too detailed, and too much hard work. It wasn't a blog after all, but an article... so it'll be turning up in a future issue of VW instead.